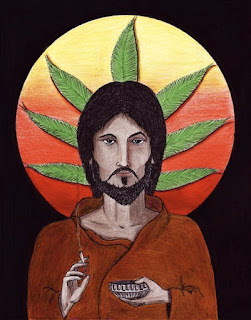 Health and Cannabis: What Would Jesus Do? I know this pattern. I witness it far too often. When elderly people are in pain, the frequency of opioid administration accelerates and within a short time I am at their bedside as they breathe their last. The morphine appears to make their death less distressing and painful, but it’s always felt like a legal loophole for a form of euthanasia. I am not a doctor or a nurse. I am a priest. Each day I am surrounded by people who are suffering from pain and discomfort. Each Sunday, people reach out with bent, twisted arthritic hands to receive bread at the altar. I visit housebound people who are sick and in chronic pain and chat for hours in my office with people dealing with anxiety, depression and other mental or physical ailments that cause them much distress. Truth be told, I have been given a way to help him. Cannabis. Cannabis has changed my life and I have been healed from a debilitating chronic auto-immune condition that I suffered with for 28 years. It was miraculous and I don’t call it that lightly (I will share that story another time). I spent every moment of my spare time learning about cannabis and how it works in the body, its long history as a medicine and entheogen in many cultures for thousands of years. Unfortunately I also learned how the “War on Drugs” essentially removed this wonderful medicine from the pharmacopeia in the 1930s. It wasn’t until the 80s and early 90s that Raphael Mechulem and his research team in Israel discovered that our bodies actually contain cannabinoid receptors and that our bodies make their own cannabinoids called “endocannabinoids” and that human breast milk contains high amounts of the endocannabinoid anandamide. In fact, all vertebrates have an endocannabinoid system – a system in the body, that helps to regulate and balance all the other systems in our body. I also learned that there are more than 200 types of cannabinoids in cannabis. Most people have heard of CBD and THC but there are many more, along with terpenes (biochemicals that gives fragrance to flowers and food) and other compounds that are potential medicine. Some people have an endocannabinoid deficiency and cannabis works as a supplement in these cases and can bring great relief to people who have conditions such as fibromyalgia, IBS and migraines. But here was my dilemma: How could I possibly even begin to suggest that my parishioners use cannabis? I was even too scared to mention it because of the stigma that decades of misinformation has created for so many people, particularly in the the church. People just don’t understand, and I get it — because I had not understood it myself until I tried it and discovered that it was not anything like I had been led to believe. Having worked as an addiction counselor for several years, I was very familiar with many drugs and had witnessed people “high” from methamphetamines, cocaine, and heroine. I had seen how these drugs, along with socially acceptable alcohol, had decimated so many lives. I didn’t know what “high” meant in the context of cannabis, so it scared me too. Now I see how misinformed I was. I was very wrong about it. It did not lead me down the path of addiction and harm, rather it had led me beside streams of refreshing water and replenished my soul. It has helped reconnect me with my body, my soul and with God. I had to experience this to understand and know. The more I began to understand cannabis and its history, the more I realized that it is actually one of the many plants that God has given us for our health and healing. It is a plant. It is non-toxic and incredibly safe. There is literally no way someone can fatally overdose on cannabis, unlike energy drinks and even water. Yes, too much water can kill us. But like anything, cannabis needs to be respected and used responsibly, with intention. In the same way that “a little wine is good for the heart”, cannabis can be used to help us enjoy life, relieve stress, and relax (which makes even recreational use medicinal). In my current church context, almost all parishioners enjoy a glass of wine. We even hold an annual “wine tasting” event. So it started to make sense to me that there was nothing wrong with using cannabis in a responsible way. In fact, some research even suggests that alcohol is actually much more dangerous than many other drugs! Jesus’ first miracle was at a wedding where he turned water into wine for the bridal party and guests who had already drank the party dry! And it wasn’t just a little wine. It was the best wine ever and was equivalent to 900 bottles! Some party, hey? The more I learned about cannabis the more astounded I became at its medicinal applications and the many, many diseases and maladies it could treat, including mental health conditions such as depression and anxiety. Research is also suggesting that CBD may even be an effective treatment for schizophrenia. There is growing evidence that cannabis can even cause some forms of cancer cells to die leaving the patient in remission. Let us remember that Jesus spent around a third of his ministry healing people and instructed his disciples to continue in this healing ministry. The first civilian hospitals were started by the church and ancient monasteries contained herbal medicine gardens and village residents would visit the “infirmarion monk” for healing and medicine. So I thought WWJD? Jesus calls us to bring healing to our world and sometimes that means taking a stand against the status quo, the usual way of doing things. 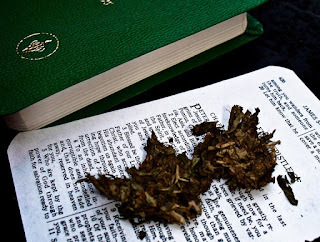 Knowing that cannabis was widely used throughout the world as a religious sacrament and as medicine, surely it is quite likely that Jesus and his disciples were familiar with this plant. Could the humble cannabis plant even be the Tree of Life? I don’t have all the answers, but it raises many interesting questions for me. Faced with a choice to keep my healing and what I have learned a secret, or to share this with others so that it may bring them relief, hope and healing…. I turned to my bible and read Acts 4:20. Can we be honest? Because I think it’s kind of an important place to start. Honesty. It’s at the root of grace. It requires that we be open about our beliefs, actions, and struggles and that we give others the same freedom. In contrast, dysfunction festers in the shadows cast by the limits on authenticity imposed by ourselves and others. 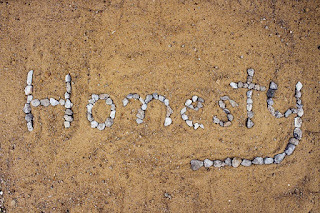 Only when people are honest about the things they believe, do, and struggle with, can real relationships flourish. This is true both individually, as in between friends, and collectively as a faith community. Unfortunately, the floor of the church is littered with ancient and current examples of all the ways this has gone awry. Some of the fault lies in ourselves. We’re not willing to be truly honest because we want people to think we’re better than we are. But sometimes the problem is with others, when we find that honesty is rewarded with loss of respect, trust, or even by being made to feel unwelcome passively or actively.